Three composers, very different but still with much in common, are united in this CD with works for cello and piano. Richard Strauss whose early pieces are strongly inspired by the music of his predecessors, Max Reger who despite all novelty and boldness is still in the tradition and philosophy of Beethoven and Brahms and, over and above, possesses the great contrapuntal abilities of a J. S. Bach, and finally Eberhard Klemmstein, who tries to rebind the threads radically severed by preceding twelve-tone and serial music – all three feel themselves obligated to a certain tradition. Up to the point that Arnold Schoenberg made an attempt to establish new theories and rules of composition it was not unusual for composers to study and analyse the music of their predecessors and implement some of its elements in their new works. 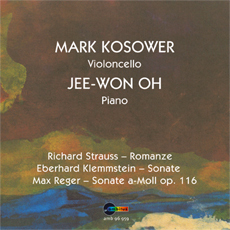 The American cellist Mark Kosower and his piano partner Jee-Won Oh belong to those musicians who have preserved their curiosity for contemporary music and less known works. Because, as they say, this is a source of inspiration revealing new aspects, understanding and ideas for the interpretation of old, well-known and often performed works. The audience can thus share the joy of their discoveries.